An English architect designed the palace. Sir Vicar's monogram "VO" is on the furniture, walls and ceiling of the palace. It is made completely with Italian marble with stained-glass windows and covers an area of 1,011,500 square feet. The palace was built in the shape of a scorpion with two stings spread out as wings in the north. The middle part is occupied by the main building and the kitchen, Gol Bangla, Zenana Mehal, and harem quarters stretch to the south. The Nawab was an avid traveler, and his influences show in the architecture, which combines Italian and Tudor influences. Falaknuma Palace, photographed by Lala Deen Dayal in 1900. Sir Viqar-ul-Umra, the Prime Minister of Hyderabad, after a visit to Europe, decided to build a European styled residence for himself. The foundation stone for the construction was laid by Sir Vicar on 3 March 1884. It took nine years to complete the construction and furnish the palace. 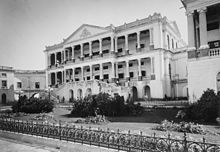 Sir Vicar moved into the Gol Bangla and Zanana Mahel of the Falaknuma Palace in December 1890 and closely monitored the finishing work at the Mardana portion. 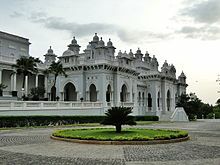 He used the palace as his private residence until the palace was handed over to the 6th Nizam of Hyderabad around 1897–1898. The palace was built and furnished at a cost of four million rupees, which necessitated borrowing money from the Bank of Bengal. In the spring of 1897, the sixth Nizam of Hyderabad, Mir Mahbub Ali Khan was invited to stay at the palace. He extended his stay to a week, then a fortnight, and then a month, which prompted Sir Viqar to offer it to him. The Nizam accepted but paid some of the value of the palace; the Paigah family maintains that around 20 lakh rupees was paid. The Nizam used the palace as a guest house for the royal guests visiting the kingdom of Hyderabad. The list of royal visitors included King George V, Queen Mary, Edward VIII and Tsar Nicholas II. The palace fell into disuse after the 1950's. The last important guest was the President of India, Dr. Rajendra Prasad, in 1951. The palace was then restored after being leased by the Taj Group of Hotels. The restoration, which began in 2000, took ten years, and was managed by Princess Esra, the first wife of Mukarram Jah. Now, the hotel is again used to host guests in Hyderabad, such as Aga Khan IV, Ivanka Trump, and Narendra Modi. The reception room of the Palace. The palace has 60 rooms and 22 halls. It has considerable collections of the Nizam's artifacts including paintings, statues, furniture, manuscripts, books, an extensive jade collection, and Venetian chandeliers. It has a library with a carved walnut roof, a replica of the one at Windsor Castle. The library houses more than five thousand books. It has an extensive collection of English, Urdu and Persian books as well as copies of the Quran, and rare first editions. The dining hall can seat 101 guests. The chairs are made of carved rosewood with green leather upholstery. Burroughs and Watts from England designed two identical billiards tables, one of which is in Buckingham Palace and the other in the palace's billiards room. In 2010, Taj Hotels started renovating and restoring the palace. The renovated hotel was opened in November 2010. ^ "Falaknuma palace". Retrieved 3 March 2015. ^ a b c d e Mamotra, Anyushi (24 January 2011). "Taj Falaknuma Palace review - One with the sky, one with royalty". The Hindu Business Line. Archived from the original on 8 February 2019. ^ a b c Borah, Prabalika M. (25 February 2017). "Falaknuma Palace: Turning the pages of history". The Hindu. ISSN 0971-751X. Retrieved 10 October 2018. ^ Business Standard. "Affairs of state". Business-standard.com. Retrieved 20 December 2012. ^ Mohammed Azam Pasha. "Falaknuma Palace". Archived from the original on 16 March 2008. ^ "Jewel in the crown: a palace fit for a Nizam". The Guardian. 20 February 2011. Retrieved 8 June 2018. ^ Seshan, K. S. S. (21 February 2018). "The story of a Hyderabad Nizam and his diamond paper weight". The Hindu. ISSN 0971-751X. Retrieved 19 October 2018. ^ Taneja, Richa (27 November 2017). "All About Hyderabad's Falaknuma Palace Where PM Modi, Ivanka Trump Will Dine". NDTV. Retrieved 7 June 2018. ^ "Architecture of Falaknuma Palace". tourism-of-india. Retrieved 7 June 2018. ^ "Ratan Tata to meet K Rosaiah on November 7 – Money – DNA". Dnaindia.com. 31 October 2010. Retrieved 20 December 2012. ^ Cook, Sharell. "Falaknuma Palace Hyderabad Opens as a Luxury Taj Hotel". Retrieved 9 November 2010. ^ "The Tribune, Chandigarh, India – Main News". Tribuneindia.com. Retrieved 20 December 2012. Wikimedia Commons has media related to Falaknuma Palace.